Since buildings are responsible for about half of our total annual energy consumption, it only makes sense to design and build them with a lower appetite for energy in the first place. 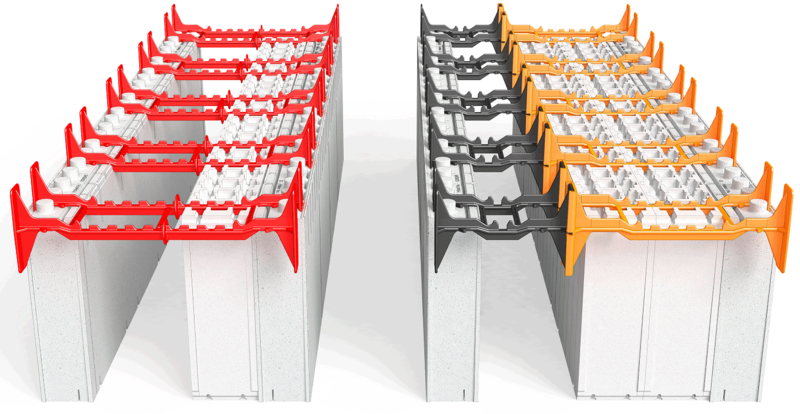 Quad-Lock Building Systems, Ltd. continues its tradition of leadership and innovation with the introduction of the new Extra Panel, which is designed to provide even more insulation value to concrete walls. Insulated Concrete Forms inherently are very airtight to meet any efficiency standards, but options for additional insulation have been limited in most ICFs. Perhaps the most stringent energy efficiency standard in the world for buildings, the German Passivhaus Standard, states that only with an optimized building shell design can you achieve ultra-low energy buildings. Superinsulation of the floor, the walls and the roof, and advanced window technologyare the required components. It is also important to note that this standard identifies that the insulation is best placed on the exterior of the building. Optimizes use of the thermal mass capacity of the concrete structure by further isolating it from extremes in exterior temperature and other weather conditions. Note examples of “TMO” (Thermal Mass Optimized) configurations in Figure 1 below. The building shell now serves as the most effective barrier (also called a “delaying mechanism”) between outside elements and the conditioned air space inside the building. The end result is far less effort required on the part of the building’s HVAC system to balance the loads imposed by exterior conditions. 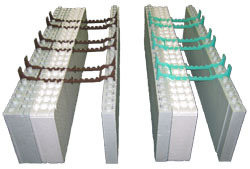 Quad-Lock panels are made of Expanded Polystyrene (EPS) with a fire retardant. EPS is considered to be world class insulation with qualities that makes it impervious to time and moisture. EPS is inert and chemically stable and will not emit any gases into living areas under normal use. The R-Values below were calculated per ASTM standard C518 at 75˚F (one of the few methods allowed by advertising laws).Note that the ASHRAE Handbook allows using higher and more accurate R-Values for EPS, especially under colder conditions, in contrast to some other insulation materials that perform worse than advertised when heating or cooling is actually required. EPS is very different from XPS (eXtruded polystyrene) and other insulation products due to its inherent long-term (20 years+) resistance to water accumulation. Product selection and take-offs are easiest with the Online Estimator or Excel-based Estimating program. Disclaimer: Thickness of EPS foam on the building’s interior should not exceed 4¼” unless approved by a licensed engineer and building officials. Some configurations / insulation thicknesses may not be allowed by local building codes without specific approvals – see Guide to Code Compliance. Notes: TMO = Thermal Mass Optimized; All stated R-Values contain R-2.66 for: inside air, ½” gypsum wallboard, 6″ concrete, 5/8 T1-11 Finish and outside air. Longer ties accommodate the added thickness of insulation without sacrificing the cavity width for concrete. 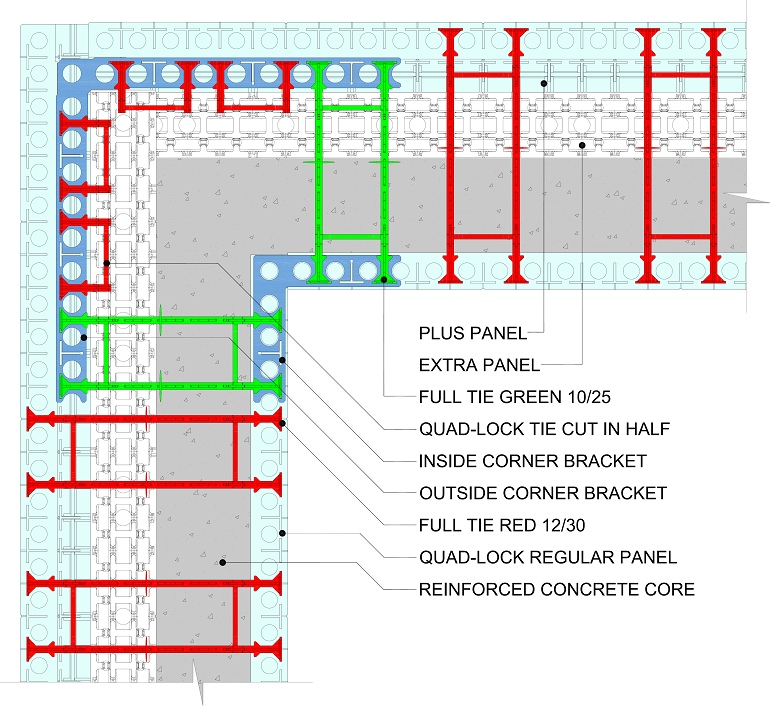 While only 5.75″ concrete cavities are shown in the previous table’s examples, many combinations of ‘off-the-shelf’ standard Quad-Lock Ties and the Quad-Lock Extender Ties are possible to create wall sizes that meet the structural requirements of the design. Quad-Lock Ties now come in 6 standard lengths and can create a range of nominal cavity sizes from 4″ up to 14″ (when placed in 2 Quad-Lock 2¼” Regular Panels). Quad-Lock Extender Ties each add 12″ to any Standard Tie. All Quad-Lock Ties are color-coded. When a 4¼” Plus Panel is used for the exterior side form, either of its two rows of tie slots can be used to position metal corner brackets and plastic ties. If the tie flanges are not required to function as anchor points for exterior finishes, we recommend that you place the Outside Corner Brackets and the Corner Ties on the inside row of tie slots (see Figure 3). 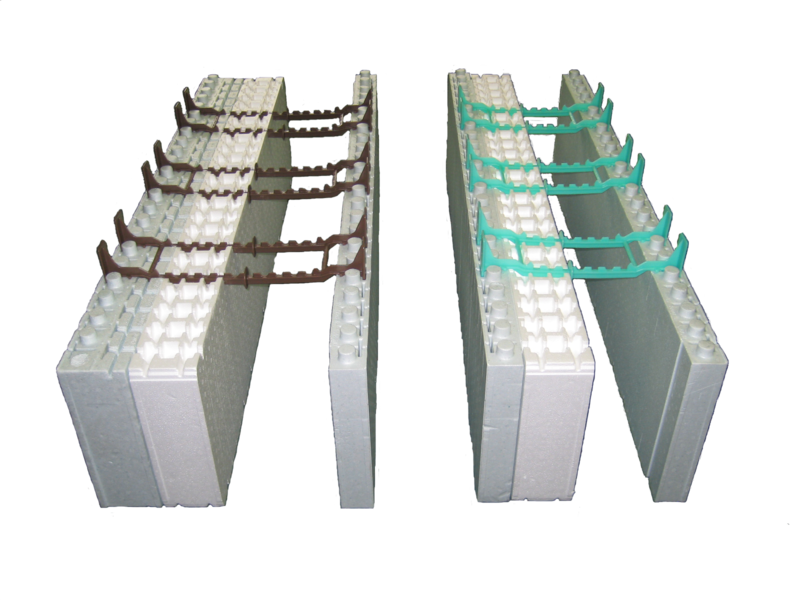 Quad-Lock Extra Panels do not require their own metal track, as they are supported at both the interior and exterior building faces by Quad-Lock Regular and/or Plus Panels. 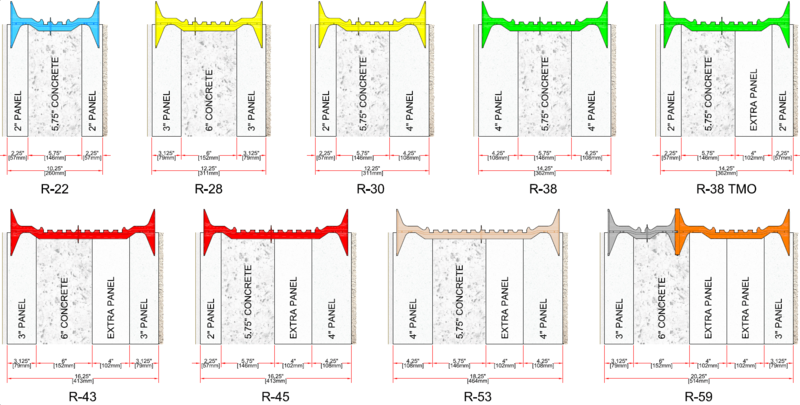 It is only the two outboard layers of panels (Regular or Plus) that need to be contained by their respective 2¼” or 4¼” tracks at the bottom of the wall. The same is true at the top of the wall where the track is usually inverted and placed over the panels, but without Quad-Lock Wire Top Ties to connect the panels. Instead, wood or metal cleats are fashioned to fit the added width of the wall assembly, and screwed at regular 3′ to 4′ intervals along the track at the top of the wall. These cleats and the metal track can be removed and re-used after the pour is complete and the concrete sufficiently set.